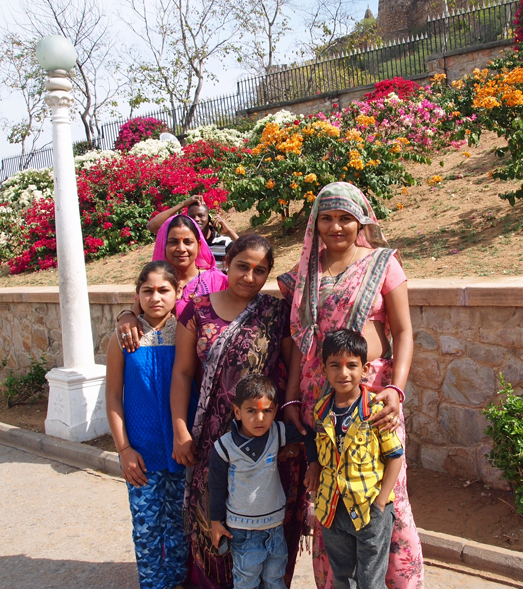 Jaipur was the first city in India where I arrived on my own. I had opted out of an overnight train from Varanasi to Delhi with a connection to another train to Jaipur. I was concerned about what would happen if the train were late which is so often the case. From Varanasi to Delhi I went by plane, a fantastic experience which I will relate later. 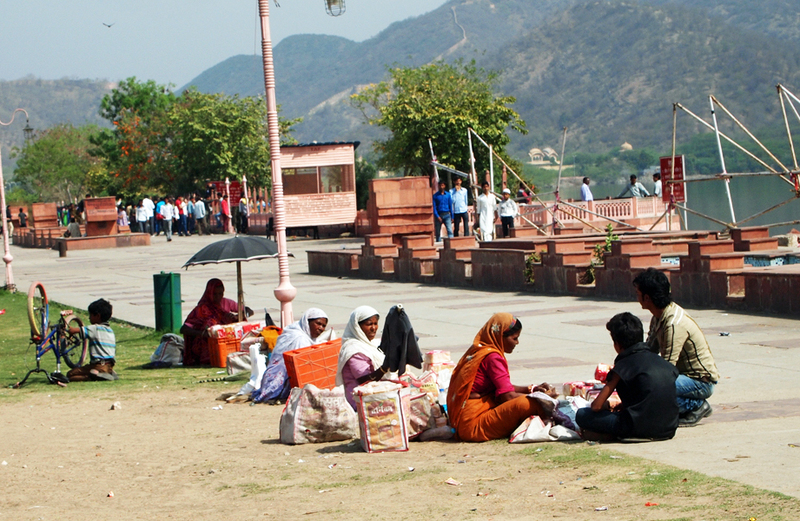 On from Delhi to Jaipur by car was a visually stimulating experience but more on that another time. One of my joys in Jaipur was just riding in the Auto Rickshaw and seeing the sights of people on motorcycles, people doing ordinary things but wearing inspiring clothing and doing double takes as I saw camels pulling carts and rickshaws. I even saw an elephant as the Auto Rickshaw driver maneuvered his way around the large pachyderm which was heavily made up with an image of a lotus flower on her face. My camera was too slow to catch that but I did get one of the rear and tail of the elephant but I will spare you that. 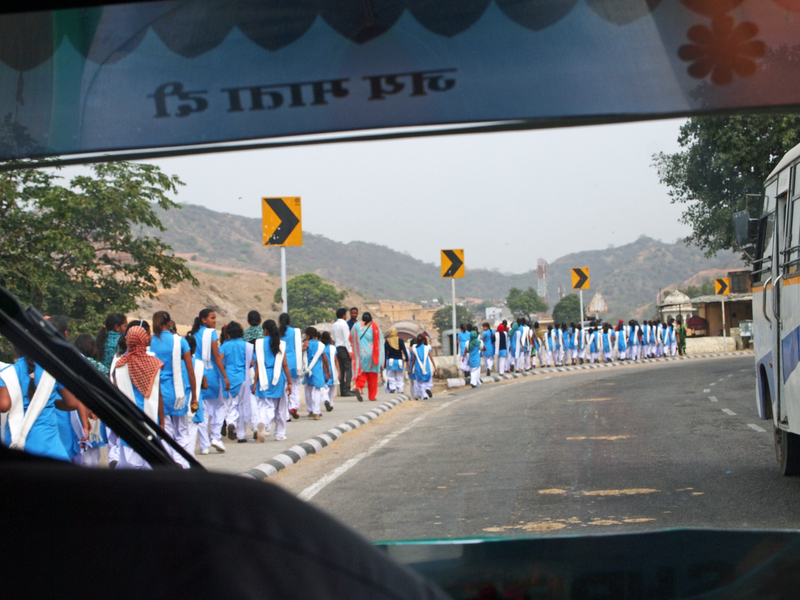 On my way to the Anokhi Museum, I passed a group of school girls dressed in their blue and white uniforms. They seemed amused to see me in the auto rickshaw and turned to smile and wave. I found that quite enchanting. I was being welcomed to this city by everyone. Auto Rickshaws are the main way of transportation, there are also shared rickshaws with very low prices and many, many motorcycles. I cringed many times seeing a family or four on a motorcycle with none wearing helmets. 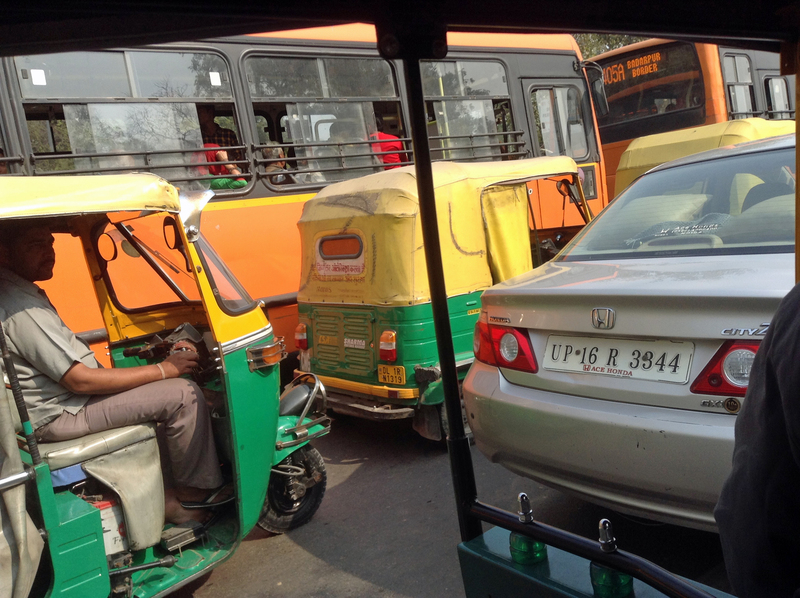 On the plus side I did not see one auto , motorcycle or auto rickshaw accident the entire time I was in India. Drivers are incredibly focused and drive much closer to another vehicle than I am used to. Auto Rickshaws are basically a three wheel vehicle like a golf cart with a tent like top, no windows. In the front is the driver’s seat in the middle but often has a friend or other passenger on either side. Then the back seat is a bench seat which is adequate for two adults or two adults and one child. It often holds as many as six people in the back section. Behind the seat is a place for luggage or groceries if needed. My reaction to riding in them started with me holding on to a bar that separates the front and the back seats with my knuckles being completely white from clenching so hard. But here in Jaipur, I did not even hold on. I let my body relax and just moved with the many swerves to avoid cows, motorcycles and pedestrians. Once I even found that I had fallen asleep briefly. What a long way I had come. I still did not like the dust, auto fumes that continually swirled around. I found myself wearing my sunglasses most of the time to protect my eyes. I used a scarf over my face as did many other passengers. I did see others (natives) who wore surgical masks but not many. Talking with Auto Rickshaw drivers was another education. Those whose English is good, can command higher prices. In India, driving an auto rickshaw is a good job. The drivers I spoke with talked of their family and their homes. Some told me things about their religious holidays and told me that India was very open to all religions. Another driver seemed to have a strong prejudice against a particular group saying they had far too many holidays. Was that a real prejudice or was it just because the many parades on religious holidays make it difficult to drive? 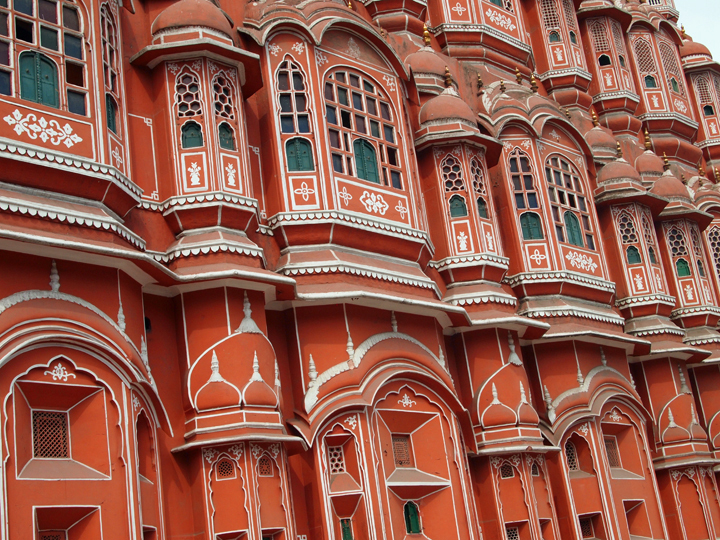 Time seemed to pass quickly even as I saw Biral Mandir Temple, Hawa Mahal (Palace of the Winds) and the Water Palace on my first day. The second day was another treat seeing Anokhi Hand Printing Museum in a lovely renovated building with many of the original stairways and great examples of hand printing. 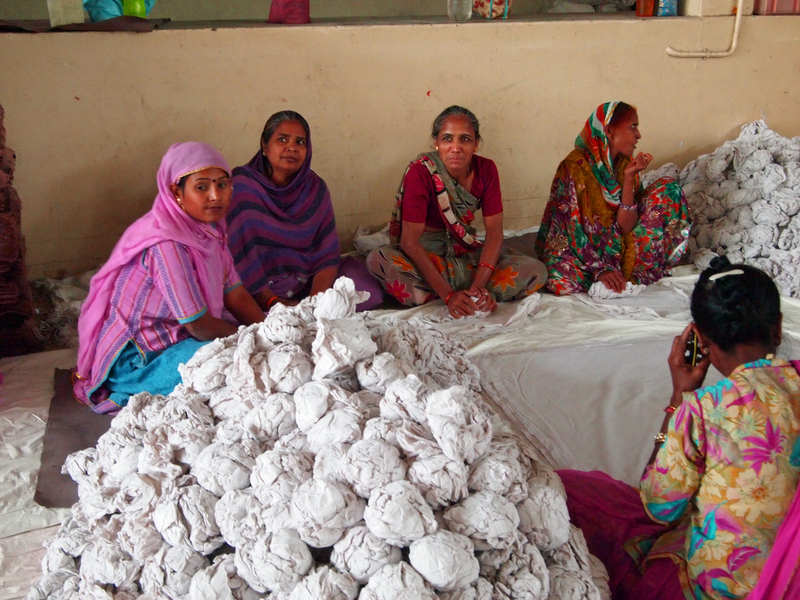 I stopped in at Village Textiles to see a demonstration of Block Printing, a large array of fabrics, rugs, all types of table coverings and cushion covers. I ended up buying a few small items. It was somewhat overwhelming but I was able to have a cup of chai and resist most that was offered. I had the feeling that the prices asked depended upon who was buying. I loved the experience. 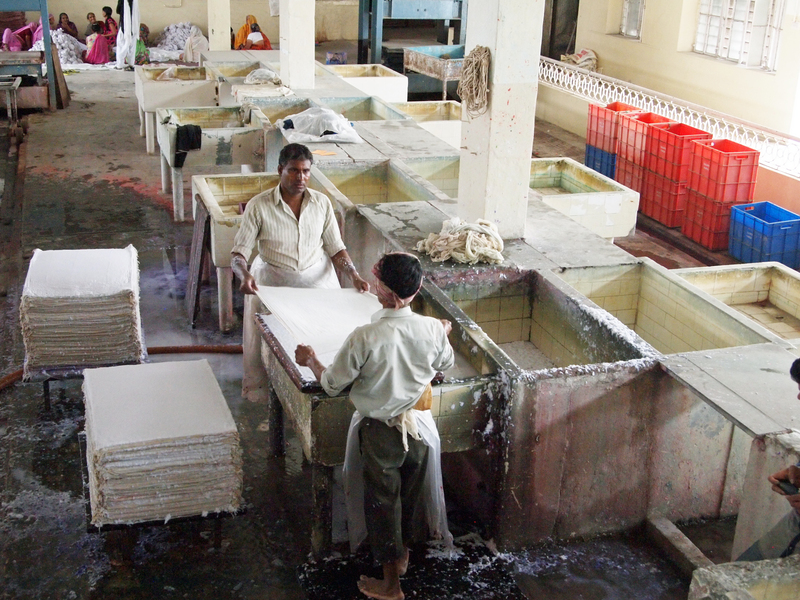 The final stop of the day was to the Paper Factory which was a real highlight of both the day and the trip. A representative of the company gave me a grand tour beginning with making the pulp and all the steps to come up with the finished product either art paper, gift wrap, lamp shades, boxes and stationery. I was quite amused as it seemed like a place from a few centuries ago until I spotted one of the workers on a cell phone. 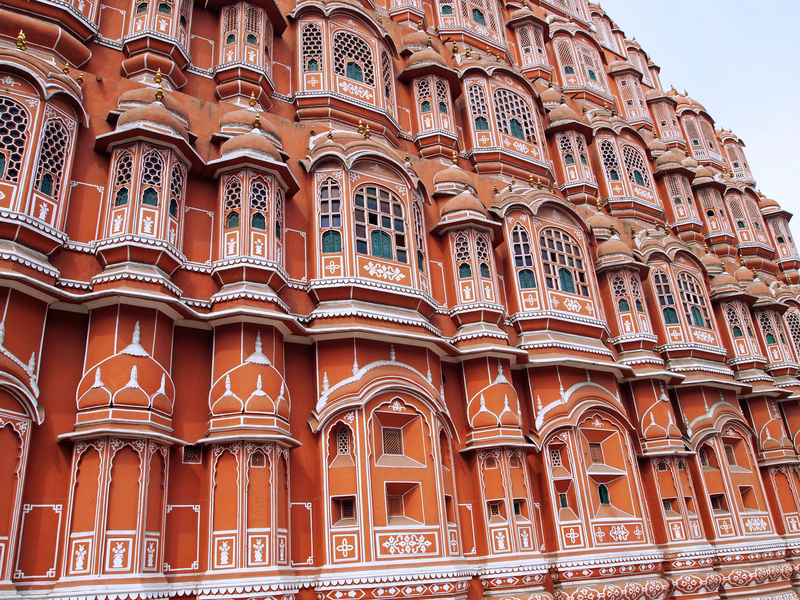 Jaipur was my first stop in Rajasthan. What a marvelous region. This entry was posted in Contempory, cultural experience, Experience the Moment, Jaipur, love of life, travel, Travel in India and tagged art, family life, hand made paper, Inspiration, Jaipur, Rajasthan. Bookmark the permalink.